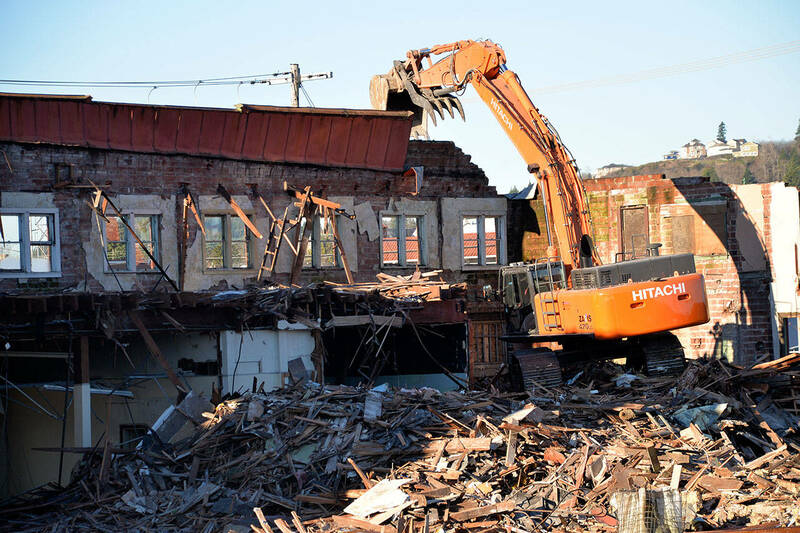 (Louis Krauss | Grays Harbor News Group) An excavator from Rognlins Inc. demolishes the old Selmers Furniture building in Aberdeen next to the Pourhouse, which was also taken down. Demolition began Tuesday on the Selmers building in downtown Aberdeen, after the adjacent Pourhouse structure was taken down Monday. Louis Krauss | Grays Harbor News Group Demolition of the Selmers building continued on Tuesday after the adjacent Pourhouse structure came down Monday. The City of Aberdeen plans to save some of the bricks for construction of the Gateway Center. (Louis Krauss | Grays Harbor News Group) The view from F Street as the old Selmer’s building is brought down to make way for the planned Gateway Center in Aberdeen. (Louis Krauss | Grays Harbor News Group) An excavator prepares to break off part of the old Selmer’s building in Aberdeen on Tuesday.